Flexpak has designed several products that allow for more breathability in pallet cover functionality. 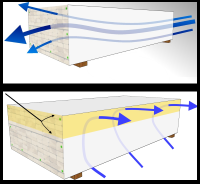 Both design and plastic plays a role in breathability, and Flexpak has the ability to manufacture a range of pallet covers which allow for protection and a vented system. The basic problems with moisture control when covering wood, timber, or siding can be reduced with the breathable solutions found at Flexpak. Mold, mildew, and wet products are obstacles that are encountered by covering a variety of different pallets, but there are a few different solutions. Two distinct approaches to a more breathable lumber cover have been taken at Flexpak. The type of plastic can have as much effect as the cover design. Issues with moisture control usually consist of removing moisture in the cover while simultaneously not allowing more moisture to enter from the outside. While reinforced gortex-like products would be nice, there are solutions for lumber or wood products that will be more cost-effective. The solution is to utilize a breathable approach to the woven plastics or sheet plastics that make up the lumber and wood product pallet covers. There are also several different Hybrid Designs which can be manufactured, allowing greater air-flow and reducing the probability of moisture breaching the pallet cover barrier. Breathable lumber covers can be manufactured with different plastic thickness (measured in mils) or with different weights of woven lumber wrap materials. Sides of the pallet cover can be manufactured with different specifications than the materials on the top, providing different strengths and breathability requirements for different areas on the package. Printing options are possible with all breathable pallet covers. While covers made from woven polyethylene allow for a 4 color print, breathable covers made from plastic sheeting can have up to a 8 color process print. Covers can be delivered by box, bundled on a pallet, or manufactured on perforated roll stock. Contact Flexpak at any point to discuss the different possibilities for breathable pallet covers or possible solutions to moisture control.